Village of Lakefield for the area’s winter carnival known as Polar Fest. It started out with a small budget, which provided the opportunity to create ice sculptures around the Village. 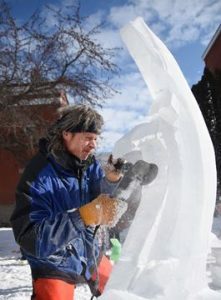 As support and interest grew within the community I began to call upon other ice carvers to assist in the sculpting process. As more professional carvers became involved we embraced the opportunity to harness the talents that these individuals brought forth and capitalize on the natural competitive nature of those involved. 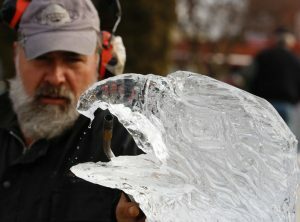 Chef Brian Henry is a founding-facilitator of Lakefield Polar Fest Ice Sculpting Competition. As the event grew Jennie and John MacKenzie owners of The Lakefield Pantry came onboard with her husband John and have worked at developing the funding and support needed to make the Lakefield Polar Fest Ice Sculpting Competition a sustainable platform for the Village of Lakefield. The Lakefield Polar Fest Ice Sculpting Competition has been proudly sponsored and supported by the Lakefield Village Merchants since 2004. 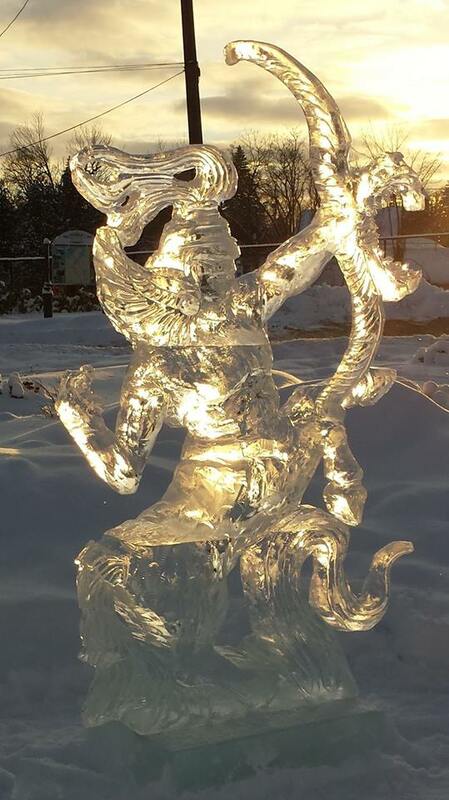 If you are looking for Ice Sculptures, Ice, Ice Carvers and or consultation for hosting an Ice themed event please contact us for information or assistance. As an added feature to your next event we can create an ephemeral sculpture to dazzle your guests. From corporate logos to decorative designs let us accent your event and capture the moment in ice. Ice Sculptures are customized to suit your individual needs. Although the sculptures are ephemeral, the impression it makes on your guests will last a lifetime. Each sculptor(s) or team will have 2-3 blocks of ice to work with. You can have a fourth block to carve with, but it will need a logo of one of our sponsors carved into it. In addition to prizes/awards for the 1st, 2nd and 3rd place winners, all carvers will be given $100.00 to help offset incurred personal costs. 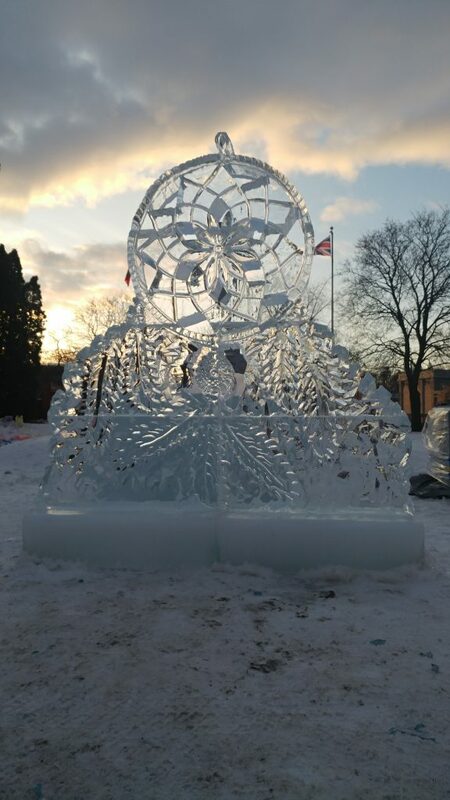 The People’s Choice Award will be given at 5:00 pm, with an Ice Carvers’ Reception from 4:30 pm –5:30 pm immediately following the competition Saturday evening at The Thirsty Loon Pub. Please keep in mind that entrant space is limited and it fills quickly. Please respond by, January 20th, 2019. If you are interested please reply to me ASAP, and I will forward more information to you. Don’t hesitate to contact me if you require any additional information. The following guidelines will assist you with your plans to participate in the upcoming Polar Fest Ice Sculpture Competition on Saturday, February 2, 2019. A minimum of two blocks of ice per entry will be supplied by The Lakefield Village Merchants (40”x 20” x 9.5” – approx. 270 lbs per ice block). 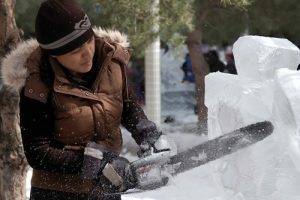 Ice carving will take place on Saturday, February 3, 2018 from 9 am to 4 pm. Please arrive at Cenotaph Park in Lakefield at 8 am for instructions for the day. The Awards Presentation will take place on Saturday at 4:00 pm with a reception from 4:30 pm – 5:30 pm immediately following the competition. Participants are responsible for supplying their own tools and materials – electricity will be provided. Neither ladders nor chairs are provided and it is the sculptor’s responsibility to provide these if necessary for their carvings. Please remember to bring extension cord(s) if you will be using chainsaws or other tools that require power. A limited number of generators will be on hand. You may choose to bring your own generators. Carvers that choose to carve outside of the designated theme will not be considered for prizes and / or awards. In the event that this happens any votes cast for sculptures carved outside of the interpretation of the dedicated theme will be deemed void. If such a situation arrives, it will be at the facilitators judgement to decide on participants validity to adhering to the theme and will have final decision ruling on the matter if it arises. The sculptures will remain on display for the whole weekend and as long the weather allows them to last. Once completed, all sculptures become the property of The Lakefield Village Merchants. The Lakefield Village Merchants retain exclusive rights to the sculptures and the use of any photographs, videos or reproductions thereof for future promotional, commercial or other applications. Parties interested in the use of photographs, videos or reproductions of the sculptures for commercial, promotional or other use application means must receive written approval of that use from Brian Henry, Competition Facilitator and from the Lakefield Village Merchants. Carvers shall be entitled to use photographs of the sculptures they themselves created for their personal portfolios and such use shall be excluded from this restriction. Safety is very important. In order to ensure the safety of all participants, we strongly recommend that personal protective equipment be used in order to avoid injuries due to the use of electrical or manual equipment. This includes safety boots, hearing protection, protective eyewear and other relevant safety equipment. Each participant is responsible for their own safety, as well as the safety of other competitors and the general public. The Township of Selwyn, the owners of property on which sculptures will be situated and The Lakefield Village Merchants will in no way be held responsible for injuries and/or damages incurred to the carvers/sculptors and their support team. The carvers are responsible for their tools and equipment. No rewards will be paid out due to loss, theft or damage to tools, equipment and personal effects. Other than the annually set theme there are no set parameters as to design to the sculptures, a general sense of taste must apply, with a liberal approach to keeping the sculptures in the realms of political correctness. As well this approach applies to the sculptor’s behavior and actions while partaking in this event. Most importantly this is a fun, small town event that brings together a community of sculptors who work together, assisting each other and reflecting the values of our small town. 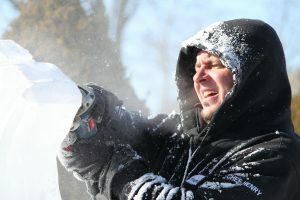 This means that you may have to lift and transport blocks of ice, carry your own tools and be prepared to assist your fellow carvers when called upon to do so. Deadline for entry is January 20th, 2019. Number of blocks requested: One Two Three . Short 100 word bio about yourself and or your team for press release.